The economy has never been better, and Americans are getting their jobs back at a record pace. For the second quarter in a row, economic growth has exceeded 3 percent -- a miracle given that just two years ago, people wondered whether or not we were stuck in semi-permanent slow growth doldrums. Despite these historic improvements, things are still far from perfect. As a country, we are facing a battle over the idea of what it means to be an American. Right around the corner, the midterm elections are a litmus test that will determine whether Americans will choose the positive changes over the morally problematic aspects of today's political landscape. Not unlike the 2016 presidential, there are many prognosticators who feel that they have a reliable pulse on what is going to drive people to vote in the Nov. 6 election. Will liberals' disaffection with the president's tone and tenor produce a blue wave of Democrats elected to Congress? Or will conservatives' indignation over the witch hunt spectacle of the Kavanaugh confirmation hearings drive them to the polls? What will American political leadership look like after Nov. 6? After it is all said and done, it will be the voters, not prognosticators, who will decide the course our nation will take. The media is fragmented and under siege like never before. It is no longer seen as the neutral arbiter of truth, providing a fair and balanced account of issues. Instead, it is perceived, rightly or wrongly, by the American people as a group of peddlers of propaganda who represent the corporate and political interests that support them. As a result, the news cycle is becoming increasingly bewildering, with even the most sensational stories being reduced to sound bites. Less than a month has lapsed since the momentous theatre of the Kavanaugh hearings, which, according to the media, were supposed to galvanize the blue wave. Instead, it has been relegated to a mere footnote by whatever the new scandal of the day might be. As exemplified by the polls and media jargon leading up to the 2016 election, in an absence of objective truth in the media, predictions about what voters are going to decide are almost meaningless. No matter what the so-called media "experts" try to tell us about the midterm elections, chances are it will come down to the news of the week. Will the president be able to control the cycle from his early morning perch above the Twitter feed? Or will outside events, such as last Saturday's Synagogue massacre in Pittsburgh, drive the narrative and make it hard for him to control the spin? We are a week away from the election -- which is an eternity in today's news cycle. In the mean time, anything could happen. Meanwhile, the president has been squarely focused on driving Americans to early voting, the only insurance he could possibly have against the fickle whims of last-minute voters. In his constant rallying ahead of the midterms, Trump has made it clear that the elections are a referendum on his presidency. 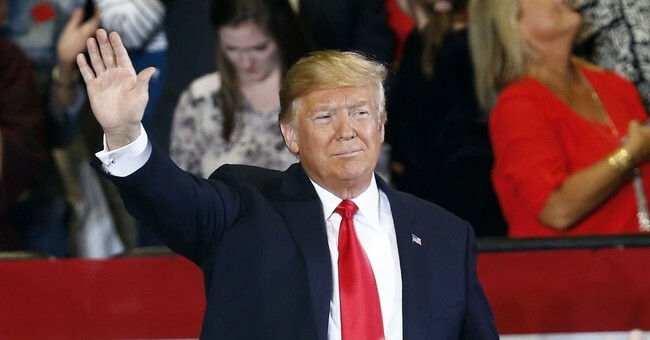 He seems to be making the argument that while many might consider his methods and tone unorthodox or even unsettling, the bottom line is that he has delivered on many of his 2016 campaign promises. Trump has appointed two conservative judges to the Supreme Court; he has lowered taxes for everyone, including middle-class Americans; and he has signaled that he will protect the border against the streaming mob of refugees and migrants that have gathered to breach it. While Trump might appear ridiculous at times, he's not all wrong, and voters are able to distinguish between his rhetoric and the substantive changes that he has actually delivered. The president's hands-on approach to driving party-line voting could easily drive an additional 200,000 to 300,000 votes across the congressional districts. This could provide a margin of victory for Republicans in what Senate Minority Leader Nancy Pelosi has acknowledged is likely to be a very close election -- an election that could be decided by fewer than 100,000 votes in key races across the country. Keep in mind the media elite predicted that Hillary Clinton would become president in 2016 and that there was no possible scenario to elect Trump. Many are still recovering from the puppet masters' display of ignorance and elitism. Clearly, they are out-of-touch with forgotten Americans. While the economy is doing well, there is an ever-widening breach in the moral fiber of this country. The events of the past week have demonstrated that there are no sacred places anymore. Even synagogues full of elderly women seem to be fair game for extremists. It wasn't a Middle Eastern radicalized Muslim who committed the latest act of hate and terror in Pittsburgh; it was a middle-aged white Christian male. Imagine if he had been a Muslim terrorist. Would the right have been so circumspect in its willingness to assign blame beyond the attacker himself? What responsibility does the president have in all this to mediate the anger of the white middle class that he has channeled so successfully into political power for himself? I love this country, but it's painful to see how we debase ourselves more and more each day. President Trump must, as our leader, set the example through his words and actions to change this deadly and acrimonious divide in our nation! @POTUS: We are listening for you, and we are waiting for you.